There is nothing better than to hear little puppies running through the house. Except when they’re tiny meathead puppies! That’s right, one of the most misunderstood breeds starts their life incredibly adorable and very hungry! 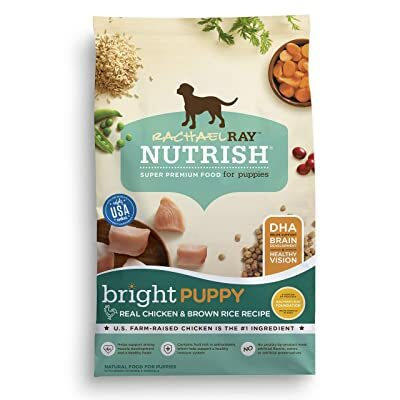 Through tons of research and thoroughly reviewing all the options available to you, this list reviews some of the most nutritious and beneficial dog foods available. After you’re done here you won’t have to look much further for the best dog food for Pitbull puppies. Now, you know your pups better than anyone, and weighing the benefits of each of these options is easy. Keep in mind, if you ever have any questions, consult with your vet! Many concerns can be resolved through diet changes and many issues later in life are avoidable with a good start, however, your vet will certainly give you helpful medical advice. What do Pitbull puppies need that makes them stand out from the rest of the puppy crowd? Well, they’re high energy, grow quickly, and crash hard at the end of the day. But, isn’t that all puppies? Although all puppies are adorable, many people have a special place in their heart and home for Pitbull’s. There’s a variety of Pitbull “types” and each one is known for providing their pet parents with many years of companionship. Aside from love and care, all you must provide these little fur balls is nutrition. So how can you best help your growing puppy? First, focus on size. Even though your pup, or liter, is small now they don’t stay that way for very long. Consider a puppy diet that focuses on large breeds. Even though Pitbull’s are counted among medium-sized dogs their muscular structure requires a little more in the protein department. Similarly, to most large breed puppies as well they continue to grow for a long time and can even overgrow themselves. A risk you want to avoid as much as possible. Specifically, prosperous and calcium is important. Too much and they grow too quickly, leaving them with a lifelong struggle of stretched muscles, and joint damage. But, too little phosphorous and they’ll be stunted. The goal is to develop strong bones and lean muscular tissue. Throughout their lives, Pitbull’s exert themselves wildly. They love playing and exercising. Many large breed dog food options support this high energy level for larger weights. All of these are lacking in nutritional value. So, it’s best to avoid them because your pup isn’t getting anything out of it and you’re paying for it. Every bite should deliver a high concentration of nutrition! It’s no secret that Pitbull’s can have a variety of health problems. But, the good news is that many of these problems are seen early in life and corrective action can be taken immediately. While all dogs are susceptible to allergies and there are many common dog allergies out there, Pitbull’s are particularly sensitive. Of all the puppies, pink skin puppies with white fur are known to suffer from allergies often. The most common allergies are to chicken and dairy. Common side effects of allergies include paw licking or biting, vomiting, diarrhea, and gassiness. Bloating is also a side effect that can lead to serious consequences and requires immediate medical attention. After a lot of research, these five standouts from the rest. There’s no guarantee that any of these will prevent the issues Pitbull’s can see later in life. However, a nutritious start is a great way to set them on the right path for physical development. Wellness is well-known for crafting recipes that benefit many breeds at once. They hit the mark for Pitbull’s here with the Large Breed Puppy Health formula. 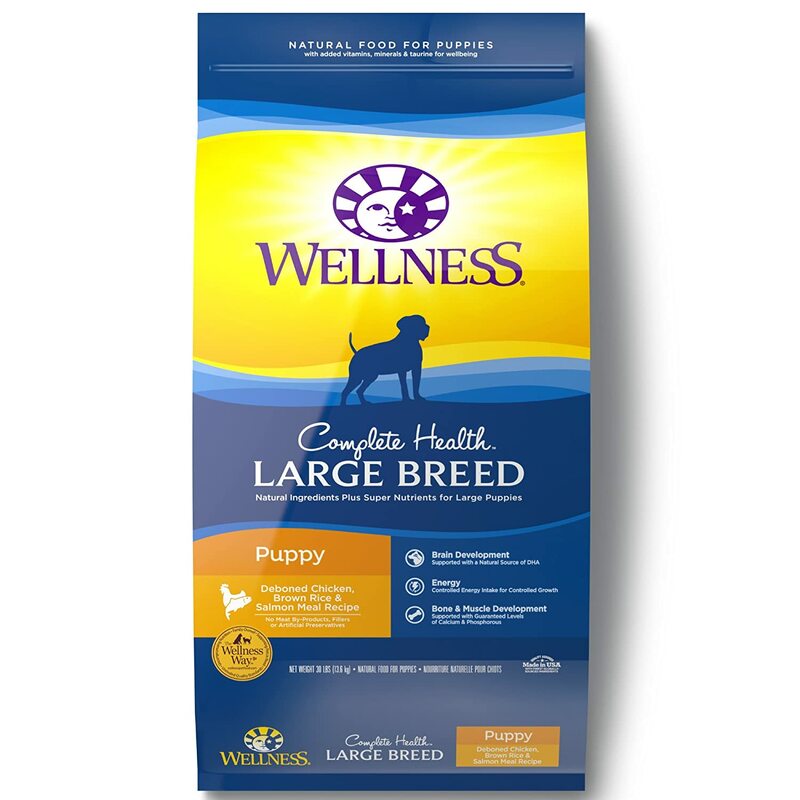 The feature that makes Wellness Complete for Large Breed Puppy Health is the perfect balance of protein fat and fiber. It has slightly higher protein which is great because there isn’t the additional increase in fat or fiber. The delicate digestive system of Pitbull puppies is why the fiber level is so important. Too much and their system is erratic and for lack of a better word, loose. But, too little fiber and the high amount of protein in most dog foods make them constipated. It’s a hard life as a Pitbull puppy. But, Wellness Complete has found the balance. The downside is in the ingredients list. The ingredients list reveals chicken and brown rice. Both are on the avoid list for a reason but often they are unavoidable in dog food. Particularly in large breed options, these are present to sustain the size and growth patterns of large dogs. Rice does act as a filler, but brown rice does have some nutritional value. This is a great option for a growing puppy. It focuses on setting up a good start for lifelong development without packing in too many calories. The steady ratio of protein to fat leaves a controlled and steady growth pattern. 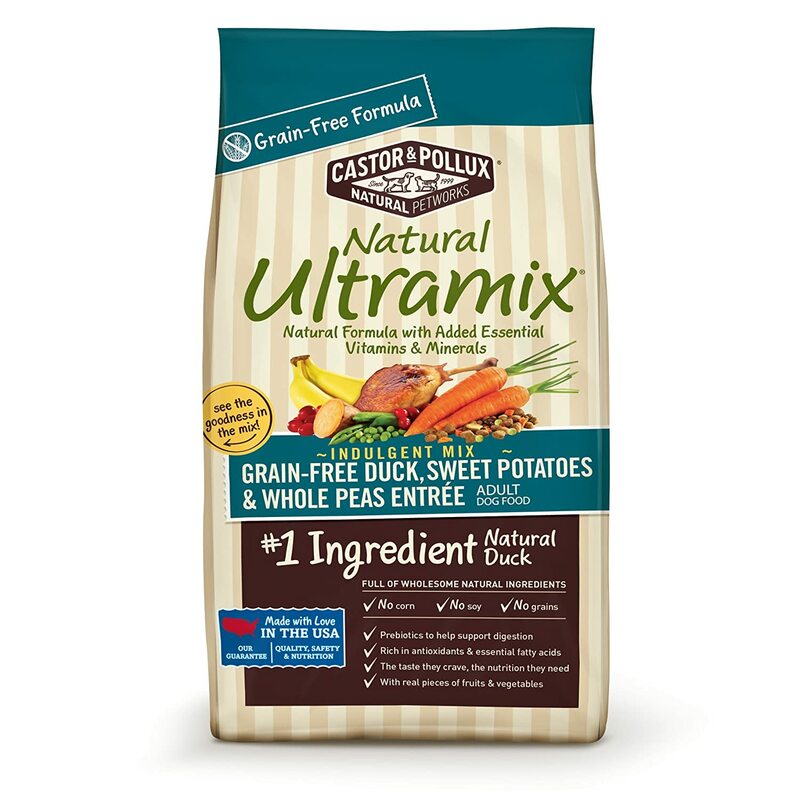 Hand down the best features from Natural Ultramix’s Grain Free Duck variety is the high amount of protein. Although it’s nearly double what is recommended in the value section this is a benefit because the fat isn’t extraordinarily elevated. What makes Natural Ultramix stand down from top pick is the low percentage of fiber. The price range you want to see a recipe for a Pitbull puppy is right around 5%. This is the tradeoff that comes with only having natural fiber and having rather low fruit contents. Other recipes that cater to older dogs have much higher fruit content leading to a lot more natural fiber. Hands down, if this is in your budget, Natural Ultramix Grain Free Duck with sweet potatoes and whole peas is a great option. Although the fiber is low many Pitbull’s and Pitbull puppies happily eat this stuff up. The only downside is you won’t know if the fiber is a problem for your pup until after you try it. Many puppies are perfectly fine with the formula. Merrick is a well-known brand. They have a ton of varieties, but the grain free chicken and sweet potato deliver a lot of what Pitbull puppies need. Merrick shines in providing lots of produce in their recipes. Although this recipe doesn’t have as much as other it still outdoes many other puppy formulas. Instead, they’ve taken apples, peas, and blueberries in a blend of high-quality proteins. There are few situations other than Pitbull puppies that more protein in place of fruits is recommended. However, with 28% protein and 12% fat you’re getting the energy your Pitbull puppy needs. 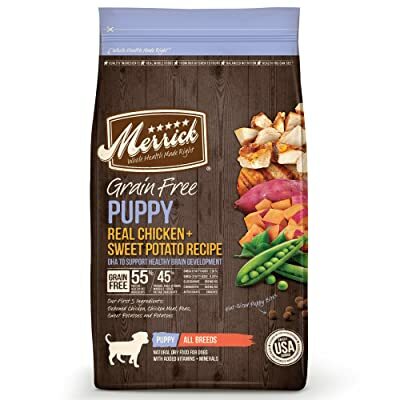 The downfall of the Merrick Grain Free Puppy Recipe is that it doesn’t pack the same punch that other recipes do in terms of calcium and phosphorous. Coming in at respectively 1% and 2.2% you should expect more than that with a puppy formula. Merrick is a great brand, and this is a great food for Pitbull puppies. It’s high in protein to meet their energy demands and has a healthy balance of fat and fiber as well. Not to mention Merrick uses real meat in addition to the meal so there are lower moisture content and eventually less filler. Using sweet potatoes is another trend to avoid fillers by utilizing nutrient dense produce. 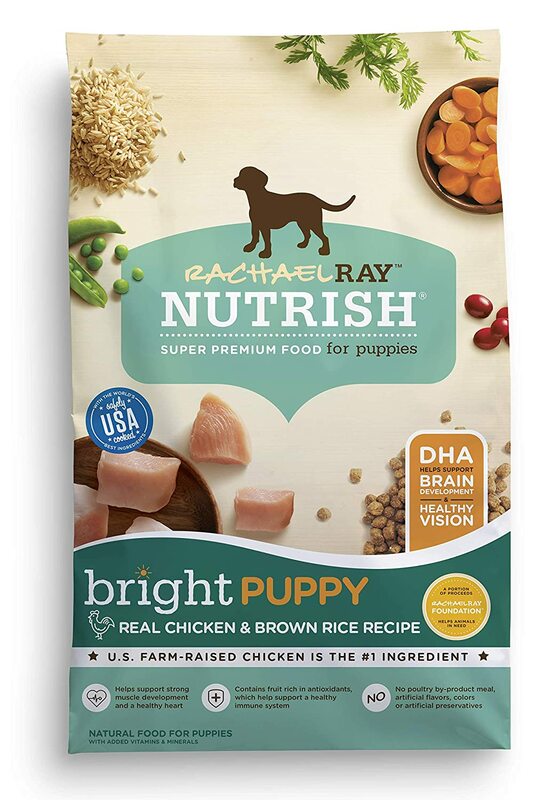 The best thing about Rachel Ray’s Bright Puppy dog food recipe is the added vitamins and minerals. Although she’s avoided anything artificial, these extra vitamins and minerals are key to a puppy’s development. Although the ingredients are top-quality there is still a number that is common allergies to dogs. Chicken as the top ingredient and following by cord within the top ten is rough for dogs that are prone to allergies. Not to mention, in the ingredients we see a soybean meal filler in the top five of the ingredients list. Because of the filler and common allergens used this isn’t the best value. However, it is a great option. If you’re looking for premium dog food slightly cheaper than most of the other options, it’s worth it! 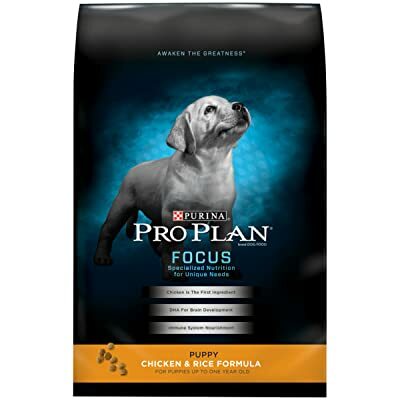 Purina is easily the most affordable option here and it doesn’t cut corners to get that way. Although they use rice and they maintain a strong protein with lamb. With 28% protein and 18%, fat Purina maintains its reputation for making high-quality dog food. There are a few things that Purina is lacking. First and foremost, fiber. It has 3% fiber which can work with many pups but isn’t ideal. With phosphorus as low as .8% and calcium as low as 1.1%, there are more nutritious options out there. But, just because this isn’t the best value on this list doesn’t mean its low quality by any means. This is a great food option for Pitbull puppies! Wellness Complete for Large Breed Puppy Health takes this list. Pitbull puppies will be happy with the blend of chicken and whitefish for a healthy protein rich recipe. But the addition of tomato pomace and salmon meal make for a lot of omega-3s, omega-6s and key nutrients for puppies. Specifically, calcium and phosphorus which are at peak levels in this formula. The lower fat content contributes to steadier growth when compared to other brands. Overall this recipe is everything listed in the values section. When changing your puppies diet be sure to give them about a week too fully adjust. They adjust more quickly than adult dogs do, but a week of slowly changing the old food to new food. Just because your upgrading your puppy’s food doesn’t mean their system is going to appreciate it right away! Give it time. With that in, we hope you found the best dog food for Pitbull puppies that works for you and your furry friends!